Nightly except 19APR, 25DEC and 31DEC. Bicheno Penguin Tour Office - 70 Burgess st Bicheno. Beachfront Bicheno, Bicheno Cabin Park, Wintersun Gardens Motel. - Return bus transfer from Bicheno Town Centre and selected Bicheno accommodation. - Expert guide and commentary. - Free photos of penguins. - Very warm clothing in winter. - Note - cameras and videos not permitted on the tour. 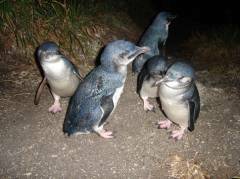 Bicheno Penguin Tours is an exciting and educational wildlife experience for the whole family, taking one hour in the evening to walk through their environment. The protected private rookery allows you to view these remarkable birds up close and undisturbed in their own environment. The experienced guides will give you a comprehensive explanation of the penguins daily life and answer all your questions. If you are very quiet sometimes the penguins will stand on your feet. Please note cameras and videos are not permitted on this tour. Child: 0-3 years inclusive - free of charge. Child: 4-14 years inclusive - child rates apply. - Cameras and videos not permitted on tour.